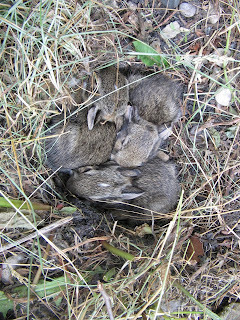 The baby bunnies appear to have moved on already. On Friday we noticed them crawling a little ways from the nest. 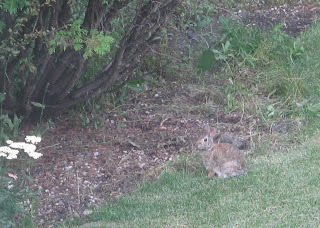 Then on Saturday morning I saw them in the nest early, then they hopped away and were gone all day. We saw them curled up together in the evening and Nigel caught a photo of the mother returning to the nest. On Sunday morning I didn't see them in the nest, and not in the afternoon or evening. They weren't there this morning either, so I guess that's it. They've moved on and are independent. 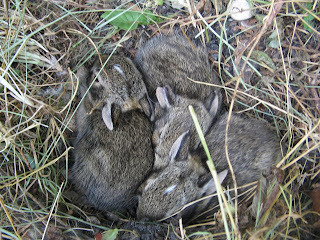 Mother rabbits have it pretty easy. Oh to bad. I guess that's it now. Mother do bunnies do have it easy. So now what? Happy Canada Day Birthday Ian!